I took these pictures from a train going North from Lea Bridge station to the new Meridian Water station. It appears that most of the electrification is almost complete, except for perhaps a hundred metres at the Southern end. This electrification seems to have gone reasonably well so far. On the other hand, the electrification of the Gospel Oak to Barking Line was troublesome with various components being wrongly made and the discovery of an unknown sewer. But the electrification of the new single track was effectively working on a new track, where what was underneath the track was very well known. I’m drawn to the conclusion, that if we want to electrify a railway, the quality of the knowledge of the tracks to be electrified has a strong influence on the outcome of the project. If there are thought to be too many unknowns and it is felt necessary to relay the track, then so be it! We may have the paradox that to electrify a 125 mph fast line like the Midland Main Line, which has had top class care and constant speed upgrades, may be easier and more affordable, than to electrify a slower commuter line like Manchester to Preston, which has probably not had as much attention, due to the slower speeds. I know it’s totally different, but decorating a new house is easier than doing the same to an old one! Electrification of a railway track seems to have a similar relationship. 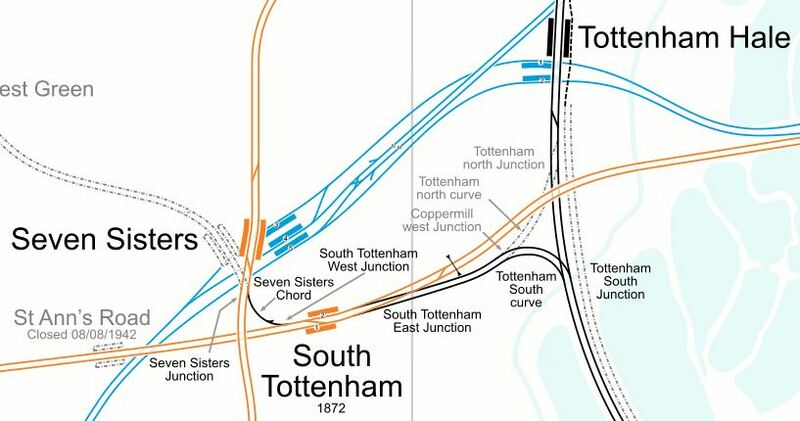 Will Trains Run Bi-Directionally On The New Third-Track Through Tottenham Hale? I ask this question, as a station-man at Tottenham Hale station, said this is what will happen, when the third track is commissioned and there are four trains per hour (tph) between Stratford and Meridian Water stations. As there is no passing loop between Lea Bridge and Meridian Water stations, only one train can run on the third track at any one time. Currently timings on the route are as follows. If I assume that it takes six minutes to change ends at Meridian Water and that journey times are a minute shorter due to the shorter distance, this means the following. A train would take twenty-three minutes to do a round trip between Lea Bridge and Meridian Water. A train would take thirty-eight minutes to do a round trip between Stratford and Meridian Water. I am led to the following conclusions. A twenty-three minute round trip from Lea Bridge means that four tph isn’t possible using the third track bi-directionally. Thirty-eight minutes for the round trip from Stratford would probably mean only one extra trip in an hour is possible. I am very certain that running a four tph service between Stratford and Meridian Water, using the third track in a bi-directional manner would be very difficult, if not impossible. I went to Angel Road station, to see if I could get any decent pictures of the new Meridian Water station. How much of the station is tastefully placed under the North Circular Road. The bridge must have some of the best views of scrapyards in the UK. The under-construction Meridian Water station can be seen to the South of the station and the bridge. I wonder how bad the pollution levels are on the platforms. The stations aren’t far away from each other as this Google Map shows. The platforms and buildings of Meridian Water station can be seen under construction to the South of the North Circular Road. Tesco (and IKEA, who are just South of the map!) won’t be complaining about the location. Stations don’t often get closed, but I can’t see many complaining about the closure of Angel Road station, which is a genuine dump. I don’t think Premier Inn will complain either, as how many of their guests have thought they’ve booked in to a hotel with a fast and frequent rail service to London, that turns out to be an occasional service at inconvenient times? Whilst, I was there taking the pictures, I was talking to a car delivery driver, who had delivered a car nearby and needed to get to Derby. I think he’d waited about an hour, before I sorted him out and he joined me on a train to Totteham Hale for the Victoria Line and St. Pancras. If he’d been thirty minutes later, he’d have waited all day. I can’t find anything on the Internet, but I suspect the third track currently being laid between Meridian Water and Lea Bridge stations will be Southbound-only for services going to Stratford. 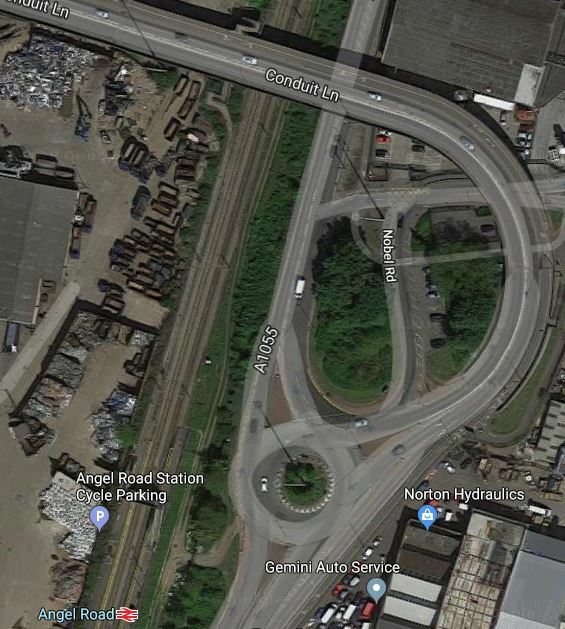 I also think, that it will be connected to the Southbound track of the West Anglia Main Linein the area of Angel Road station. 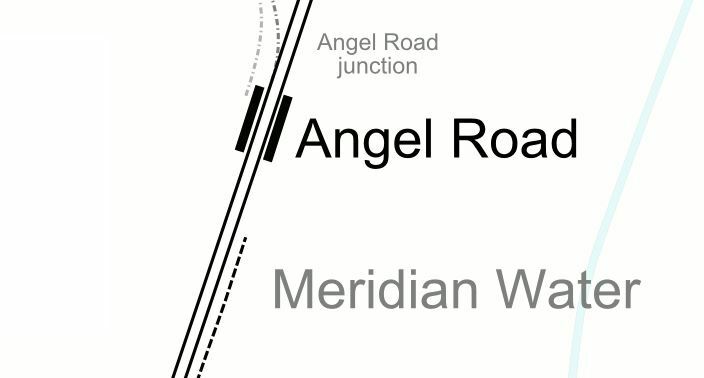 This Google Map shows the area to the North of Angel Road station. 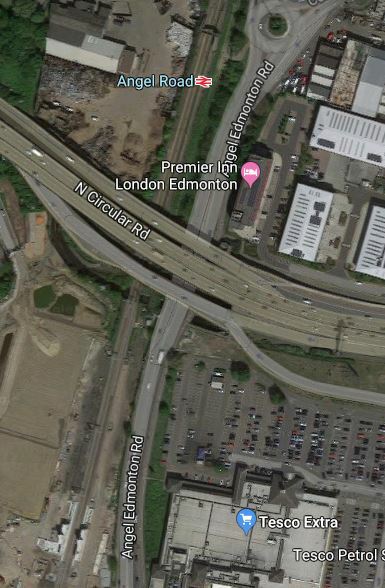 I believe it would be possible for a track to extend from the platform served by the new third track at Meridian Water station, pass behind the Southbound platform at Angel Road station and then connect to the West Anglia Main Line. A crossover could also be provided to allow trains to go North from the new third track if required. How Will Greater Anglia/London Overground Use The Third Track On The West Anglia Main Line? This morning as I often do, I took the 11:00 train between Stratford and Enfield Lock stations. I like to have a look at progress on STAR, which involves the following. A five and a half kilometre third track to the East of the current two tracks of the West Anglia Main Line between Lea Bridge and Angel Road stations. A third platform and station improvements at Tottenham Hale station. A third platform, removal of a level crossing and complete rebuilding of Northumberland Park station. Building of a completely new three-platform station at Meridian Water to replace the current inadequate Angel Road station. 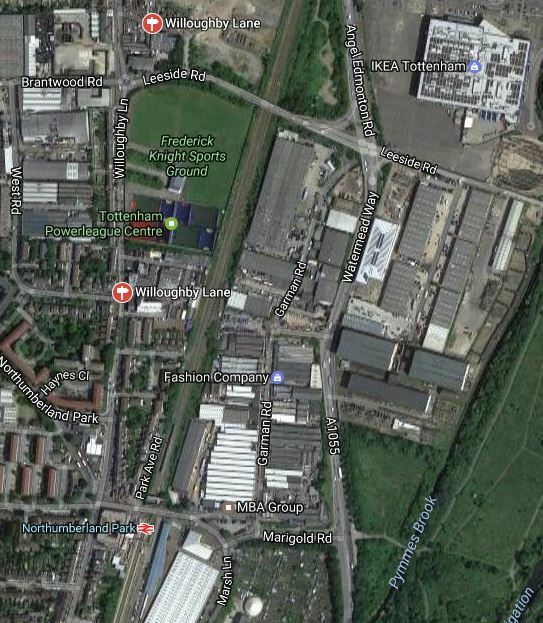 This Google Map shows the location of Meridian Water station with respect to Tesco Extra and IKEA in Glover Drive. You can just see the concrete foundations of the station and its platforms alongside the West Anglia Main Line to the West of the Tesco Extra. In Meridian Water Station – 14th June 2018, I show pictures of the station just over two months ago. There has been steady and worthwhile progess since. Meridian Water station now has platforms under construction. Northumberland Park station looks like it could be ready before Spurs’ new stadium. The lift towers for the footbridge at Tottenham Hale station are being erected. I estimate about seventy percent of the third track has been laid. All the electrification gantries seem to have been erected and there are even some overhead wires. The target for finishing the works is said to be May 2019 and I suspect that is achievable. It certainly looks like the third track will be ready, so how will it be used? At the Northern end, the third track appears to finish in a bay platform at Meridian Water station. Once Angel Road station is closed and reduced to rubble, there would be plenty of space to add a junction, so that trains going South towards Stratford, could use the third track. This would surely ease operation of the West Anglia Main Line. Meridian Water station appears to be being built as a three-platform station with provision for a fourth. From various drawings and notes on the Internet it looks like there will be two platforms on the West Anglia Main Line and a separate bay or through platform to the East. This map from carto.metro.free.fr shows the relationship of Angel oad and Meridian Water station. The dotted line on the map is the third track. I took these pictures from a slow train through the station. It looks very much like a through platform is being created. I feel that access to this platform will be in two ways. From the North via a junction with the Southbound track of the West Anglia Main Line. This junction could be to the North the current Angel Road station. From the South using the new third track. This would mean that no trains will have to cross the West Anglia Main Line using a flat junction. I don’t believe that trains can run bi-directionally on the third track, as there is not enough time in an hour for four trains to shuttle between Lea Bridge and Meridian Water. So that means all services calling at Meridian Water will go further up the Lea Valley to turn back. I think it is likely that the current two platforms will be used as follows. It would be logical that the new third platform would handle Southbound trains to Stratford. As Platform 1 and the new platform share an island, passengers will have a step-free cross-platform interchange, if they need to go to the alternative destination. The following journey times should be noted. I suspect a lot of passengers will change to a direct train. It could also mean that an ideal service would see the same frequency of trains at both platforms. At the Southern end, the third track joins the West Anglia Main Line going towards Stratford, but there is also a crossover to allow trains coming from Stratford to use the third track. Is The Third Track Going To Be Bi-Directional? Loops like this third track are often signalled to be bi-directional, to ease operation. But as I said earlier, I think the third track is too long to operate in that way all the time with passenger services. What Will Be The Operating Speed Of The Third Track? I have watched the third track being constructed and it is totally new. All bridges have been replaced with new structures. The track is fully electrified. There appear to be no junctions, except at the two ends. Everything certainly looks professional to my untrained eye. The operating speed will probably be determined by the time set for the driver to take the train between stations on the line. But the track has surely been designed to minimise the time between Meridian Water and Stratford. Could The Third Track Be Extended Northwards? The length of the third track is 5.5 km. Could the third track be extended to the North? If Crossrail 2 is built, there will be a need to make the route four tracks. Two fast tracks for the expresses between London, Stansted and Cambridge. Two slow tracks for Crossrail 2 as far as the terninus at Broxbourne. Looking from both a train and on Google Map, it appears that it will be a tight fit to squeeze in two tracks. There is the serious problems of the two level crossings at Brimsdown and Enfield Lock stations. Waltham Cross station seems very tight too. But I do think, that with a clever redesign at the three troublesome stations, that a third track, but not necessarily a fourth can be squeezed in as far as North as Broxbourne, which would be another 11.2 miles. Although in places, like these pictures taken just South of Tottenham Hale station show, there may be plenty of space for two tracks. I suspect that to put in the fourth track will mean that the bridge at Ferry Lane will need to be rebuilt. But it does appear that in building the third track, the builders are making sue there is space for a fourth track to be added in a few years. Currently, How Many Calls Are There At Each Station? These figures are calculated from the current timetable. Two tph stop in both platforms. Ten tph stop in both platforms. In addition, eight tph pass through both platforms without stopping. Three tph stop in both platforms. In addition, seven tph pass through both platforms without stopping. Four tph stop in both platforms. In addition, six tph pass through both platforms without stopping. Six tph stop in both platforms. In addition, four tph pass through both platforms without stopping. In addition, two tph pass through both platforms without stopping. Two tph would terminate at the station. This is summary of stops at the selected stations. To say the least service is a bit patchy, with some stations getting a much better service than others. London Overround, Merseyrail and others feel that a service of four tph is highly desirable and attracts passengers. The service definitely needs improvement. It is certainly intended that four tph, will be run between Stratford and Meridian Water stations calling at Lea Bridge, Tottenham Hale and Northumberland Park stations. Currently, this service is provided at a frequency of two tph by Greater Anglia, who extend the service to Bishop’s Strortford station. As I said earlier to avoid train-slowing flat junctions, STAR services must terminate North of Meridian Water station. I think there are these possibilities. Bishop’s Stortford, which currently handles two tph in the bay platform 3. Broxbourne which is a large station with 8 platforms and has been earmarked as the terminal for Crossrail 2. Hertford East has platform space, but there may not be the capacity for the trains on the Hertford East Branch. Passenger numbers will drive the choice, but I suspect all three terminals have their merits. In the following sub-sections I’ll look at each terminus. I will assume these services will call at the same stations as the current two trains. Enfield Lock now has the preferred four tph. Ponders End and Brimsdown probably need more services. Are there too many services at Harlow Town and Bishop’s Stortford? But generally, it is a better distribution than now! I will assume these services will call at the same stations as the current two trains, that run between Stratford and Bishop’s Stortford. This is summary of stops at the selected stations, which will be the same for both destinations. There will be no increase in frequencies North of Broxbourne. Operational needs and passenger numbers will decide if these are better destinations. The High Meads loop under the Eastfield Shopping Centre was designed to turn trains. This map from carto.metro.free.fr shows the loop. On the map it is the horeshoe-shaped double track shown in black. , It goes through Platforms 11 and 12 in Stratford station. Currently, Platform 11 is used exclusively as a terminal for the two tph between Stratford and Bishop’s Stortford. Both ends of the loop join together just to the South of the Orient Way sidings and Lea Bridge station. In the past it has been used to turn Stansted Expresses, which used Platform 12 according to the signs still in place. I believe it would be possible to build a platform on the loop to serve Stratford International station and the Northern part of the Olympic Park. In my view it is wasted fully-working infrastructure. The most important rail loop in the UK is the loop of the Wirral Line under Central Liverpool. This loop handles fourteen tph. The loop is built for full-size trains. Trains take eight minutes to go round the loop from Liverpool James Street station and fourteen minutes from Birkenhead Hamilton Square station on the other side of the Mersey. It was built in the early 1970s and I’m sure the designers of the High Meads Loop were influenced strongly by the track layout in Liverpool. The Wirral Line Loop showcases the major examples of this type of track layout. The driver just keeps driving and doesn’t have to change ends. A single terminal platform can handle a maximum of perhaps 4-6 tph, whereas a single platform on a loop can handle at least 14 tph. Stations can be provided at several places on the loop, where they are needed. A loop is a very fast and simple way to turn trains. The 06:34 from Bishop’s Stortford stops at Tottenham Hale at 07:29, Lea Bridge at 07:33 and Stratford at 07:43. The train then forms the 08:04 from Stratford, which stops at Lea Bridge at 08:10, Tottenham Hale at 08:18 and terminates at Bishop’s Stortford at 09:02. So the train has taken thirty-seven minutes between the two calls at Lea Bridge station on a modern double track railway. If the train loaded and unloaded passengers at Platform 11 at Stratford, I suspect that this time could be reduced to under twenty minutes, if the train continued round the High Meads Loop. Even if there was an extra station on the loop to serve Stratford International station and the Northern part of the Olympic Park, I suspect that a saving on twenty minutes could be made. Greater Anglia would be a big beneficiary. Currently the train leaves Bishop’s Stortford at 06:34 and arrives back at 09:02, which means a total trip time of 148 minutes for an out-and-back journey with ten intermediate stops both ways. With a bit of time saving and the new Class 720 trains, I suspect that with the turnround time at Bishop’s Stortford added in, that a train could do the full trip within two and a half hours. This would mean that ten trains would be needed for a four tph service between Stratford and Bishop’s Stortford. This would mean that eight trains would be needed for a four tph service between Stratford and Bishop’s Stortford. 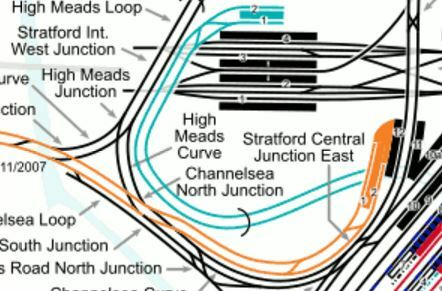 How much time would be saved if Stansted Airport trains went to Stratford and used the High Meads Loop? The fastest trains take forty-seven minutes between Liverpool Street and Stansted, with about fourteen minutes needed for the short stretch between Liverpool Street and Tottenham Hale. Using the High Meads Loop at Stratford would probably mean a similar journey time, as from Liverpool Street, but there would be other advantages, disadvantages and score draws. Both platforms used by Stansted Expresses would be step-free. Train tracks to Stratford are probably less likely to delay. Walking routes at Stratford might be shorter. Both Liverpool Street and Stratford will be served by Crossrail. Stratford could have links to Highspeed services to Kent. Greater Anglia would be a big winner, as they would have a better train utilisation. What Length Of Trains Could Use The High Meads Loop? The only restriction will be the length of platforms at Stratford, Lea Bridge and Tottenham Hale. Without getting my tape measure out, I suspect they are all capable of taking a twelve-car Class 317 train, which is around 240 metres long. Ten-car versions of Greater Anglia’s new Class 720 trains are 243 metres long. I would be very surprised if the platforms couldn’t accept these long trains. What Would Be The Ultimate Capacity Of The High Meads Loop? The Wirral Line Loop under Liverpool handles fourteen tph. More complicated tunnels under London like Crossrail, the East London Line and Thameslink are planned to handle 24 tph. Modern digital signalling will be applied in the next couple of decades to the West Anglia Main Line. The Southbound third track and the route to Stratford from Lea Bridge can probably easily handle fifteen tph or a train every four minutes. Platform 11 at Stratford with perhaps some escalators, could probably handle fifteen or even twenty tph, as do stations like Canada Water and several stations on Thameslink and the Wirral Line. Northwards from Stratford, there is probably a total limit of twelve tph along the Lea Valley, that could be increased by removing level crossing and modern signalling. I suspect that the ultimate capacity is way in excess of the number of services that need to be run from Stratford up the West Anglia Main Line. Some platforms can’t accept full length trains. West Anglia services crawk between Liverpool Street and Tottenham Hale at a speed of not much more than 40 mph at times. The two operators; London Overground and Greater Anglia want to add additional services to the station. c2c also want to serve the station, as they have capacity problems at Fenchurch Street. However, future developments will make Stratford a viable alternative to Liverpool Street. Crossrail will provide a high-capacity service linking both stations to the Canary Wharf, Heathrow and the West End. Better access to the Central Line will happen. Stratford has access to the important Jubilee Line. Stratford will be able to take advantage of Docklands Light Railway developments. Tottenham Hale station will have better interchange to the Victoria Line. So why not move some services from the West Anglia Main Line to the High Meads Loop? What Services Could Be Transferred From Liverpool Street To The High Meads Loop? At present, all stopping trains between London and Bishop’s Stortford, start from Stratford and I can see this continuing after the third track opens. I could also see extra services on this route to deliver the promised four tph to Meridian Water and Nothumberland Park. Four tph can probably use Platform 11 st Stratford, but looking at the smooth unhurried operation of the Wirral Line Loop at Liverpool, I suspect that the High Meads Loop will be used. Looking at all the other services between Liverpool Street and Tottenham Hale, only the two tph between Liverpool Street and Hertford East, stop at another station, which is South of Tottenham Hale. So it would probably not be sensible to transfer theseHertford East services to the High Meads Loop, but it might be a good idea to add two tph all day between Stratford and Hertford East, to create a four tph service to Hertford East with two tph from both Southern terminals. Some services between Liverpool Street and Cambridge and between Liverpool Street and Stansted might be augmented with more services or moving the services to the High Meads Loop at Stratford. I would suggest that about half the services went to Liverpool Street and terminated as they do now and the rest used the High Meads Loop. This would mean that those, who’d caught the wrong train or changed their destination, could just change at Tottenham Hale by walking across the island platform. I was on a train going South to Liverpool Street recently, when I changed my mind and transferred to a Stratford train. As I inew a Stratford train was close behind, I only had to wait a few minutes. Note that, if there are six trains on both branches, then the maximum wait would be ten minutes. This is definitely my speculation, but I am trying to show what is possible! I also very much believe that Network Rail, Greater Anglia and London Overground will come up with something much better. I am using these rules to guide me in my thinking. All trains going to Stratford use the High Meads Loop and Platform 11 at Stratford. No station gets an inferior service to that it gets at the present time. All Southbound trains for Stratford use the new third track between Meridian Water and Lea Bridge Junction. I think that this could be a good mix of services. Greater Anglia have said they will run a Stratford to Stansted service from 2019. The two extra Stratford to Bishop’s Stortford and Hertford East services will have similar calling patterns to the existing services. Eight tph goes to and from both Liverpool Street and Stratford. Currently, eight tph run between Tottenham Hale and Liverpool Street. Based on the my observations of the relaxed operation of the Wirral Line Loop under Liverpool, I feel the capacity of the High Meads Loop could be as high as sixteen tph. The only other passenger trains on the route are two tph between Stansted Airport and Cambridge. The number of trains running on each section of track would be as follows. Eight tph – Stratford to Tottenham Hale – Southbound trains use the third track where is has been added. Sixteen tph – Tottenham Hale to Broxbourne – Southbound trains use the third track where is has been added. I’m not sure if this would be achievable, but there are several double-track main lines in the country, that handle at least sixteen tph. The London Overground services from Liverpool Street to Cheshunt and Enfield Town have the following characteristics. A frequency of two tph. Both services pass through Hackney Downs and Seven Sisters stations. London Overgriound probably want to add two extra tph to both routes to increase the frequency to four tph. Unfortunately, the crowded lines South of Seven Sisters and a full Liverpool Street station, probably make this difficult. Look at this map from carto.metro.free.fr, which shows the lines South of Tottenham Hale and Seven Sisters stations. South Tottenham station is on the Gospel Oak to Barking Line, with the following connections. At the Western end of the station, the Seven Sisters Chord connects the station to the Lea Valley Line to Cheshunt and Enfield Town. At the Eastern end of the Tottenham South Curve connects the station to the line to the High Meads Loop at Stratford. Would it be possible to run the extra two tph from both Cheshunt and Enfield Town to the High Meads Loop? If it is possible, then the following frequencies will be achieved. Eight tph between Edmonton Green and Seven Sisters. Four tph between Seven Sisters and Stratford. But more importantly, it will create more routes for East London’s Duckers-and-Divers to challenge the clock. Large parts of Enfield and Haringey now get a direct connection to Stratford. The new White Hart Lane station will have a direct connection to Stratford. Stratford to stations on the Gospel Oak to Barking Line is now just a step-free change at South Tottenham station. I also wonder how many new sites for housing will become viable because of all the new transport links. There are several developments planned or proposed, that will affect traffic on the West Anglia Main Line. The mainly two-track West Anglia Main Line has a maximum operating speed of 100 mph, but travelling the line over the last few days, at times we were only travelling at about 50 mph for long periods. So I suspect that the average operating speed could be increased. There are also several level crossings, including those at Brimsdown, Enfield Lock and Cheshunt on the busiest Southern section of the route..
Modern digital signalling on the West Anglia Main Line must allow more trains to be squeezed into the timetable. The current trains that work the West Anglia Main Line are Class 379 and Class 317 trains. Both trains are 100 mph trains although the Class 317 trains are now nearly forty years old. They are being replaced with Class 720 and Class 745 trains, which although they are also 100 mph trains, may offer advantages, because they are newer designs. Better acceleration and smoother regenerative braking. Easier passenger entry and exit. Shorter dwell times at stations. Better passenger comfort and facilities. But crucially, they will be able to take advantage of the modern digital signalling. I think it is very likely that the new trains will speed up services on the West Anglia Main Line. I also think that the combination of digital signalling and new trains, that are capable of using it, will allow higher frequencies of trains to be run on the West Anglia Main Line. Could we see the following in the future? London Overground services on the Lea Valley Lines use Liverpool Street, as they do now. Greater Anglia services on the West Anglia Main Line to Bishop’s Stortford, Cambridge, Hertford East and Stansted Airport are split between Liverpool Street and Stratford. Stratford services use the High Meads Loop and stop at either Platform 11 or 12 at Stratford. I wouldn’t be surprised to see the following. Twenty tph up and down the West Anglia Main Line. Direct services up the West Anglia Main Line to Norwich via Cambridge using bi-mode Class 755 trains. Extra services between Stratford and Cambridge, Hertford East and Stansted. Services are adjusted so that each station South of Broxbourne gets four tph or more. Note that I haven’t mentioned adding a fourth track. I believe that my calculations show it might not be needed to achieve the required intensive service on the West Anglia Main Line. 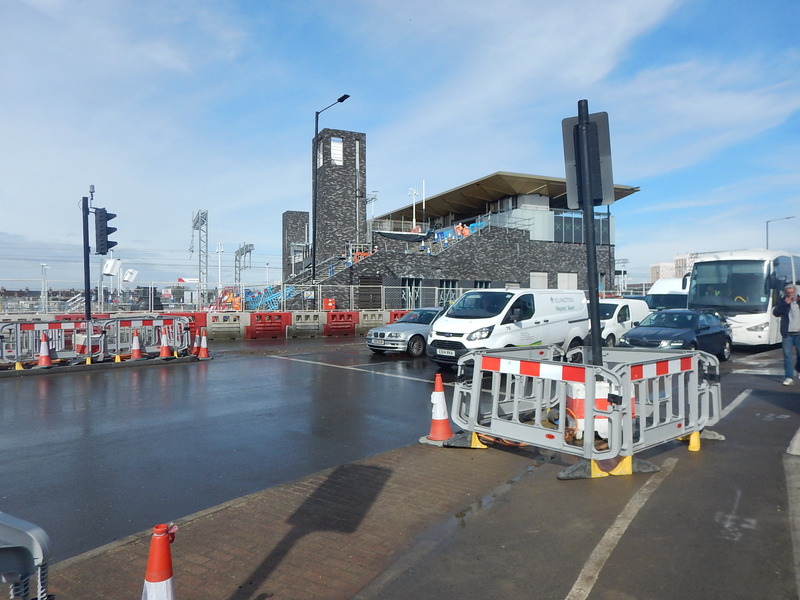 Since my last post on Meridian Water station, that was called The Site Of The New Meridian Water Station – 25th April 2018, things have moved on at a good speed. It will be a four-platform station. It will have fullstep-free access, with five lifts. It will be ready for Crossrail 2, if that line ever arrives. It will also be a step-free bridge over the railway., for those not using the trains. It will be very handy for Tesco and IKEA. It also looks like it could be ready for use in May 2019, which is the planned opening date. These pictures show the site of the new Meridian Water station. The site is substantial and the station will feature four platforms and a walking and cycling route over the West Anglia Main Line. I took these pictures from the top deck of a 341 bus, as it passed the site of Meridian Water station. It doesn’t look like it will be a small station. After reading Colin’s comment to the recent Angel Road station post and looking at the FAQ on the Meridian Water web site., I created this Google Map of the area along Willoughby Lane, from Northumberland Park station to the other side of the railway from IKEA. Willoughby Lane is actually a road that starts at Northumberland Park station and then goes Northwards to the two bus stops. I feel that the new station, which will be called Meridian Water will be built on the large clear site, between the Northernmost bus stop and the railway. These are some pictures of the that site taken on 1st March 2017. This is a Google Map of the site. I used a private helicopter flying low over the area or in more common parlance the top deck of a 341 bus going to IKEA. The entrance to the site is off Leeside Road. Fences leading from the entrance road go right up to the West side of the railway. The works to create the third track for STAR are clearly visible. A large area seemed to be fenced off off on the East side of the Railway. The Leeside Bridge seems a substantial modern structure. IKEA and Tesco to the East of the railway and the Angel Edmonton Road. I remember the station site as a gas works and these sites are often very polluted. So perhaps building a station on the top and adding car parking might be easier than building houses, unless it’s a few signature tower blocks, which would have superb views of the Lea Valley. It’s certainly going to be profitable for the developers. This is from the Infrastructure page on the Meridian Water web site. 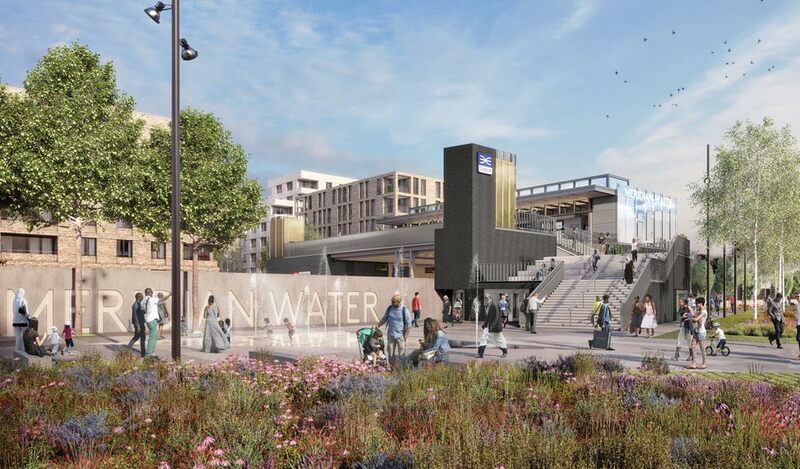 It is not very often London gets a brand new rail station, but Meridian Water Station will open in 2019, unlocking the area for commuters, taking passengers south directly to Stratford London and London Liverpool Street and north to Stansted and Cambridge. The station, which will be built on the Willoughby Lane site and replace the existing and poorly accessible Angel Road station, will provide a much improved rail connection for Enfield residents with a more frequent service into central London. This site North of Leeside Road is probably a much better-located site than that of the current station. There is a lot of space, which might enable car parking and a turnback platform. It is just off the main North-South road. 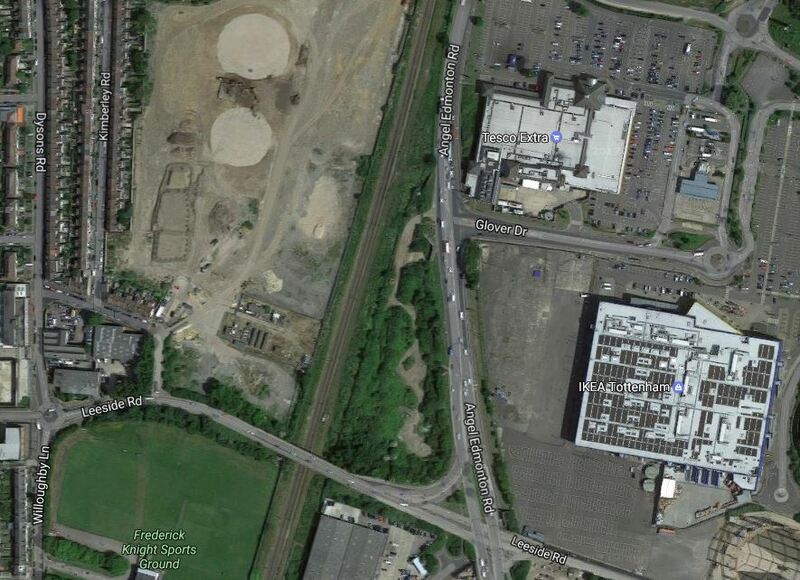 It is close to IKEA and Tesco and pedestrian access between the two would surely be possible. This visualisation is from the Meridian Water web site. It doesn’t look to be a station built on the cheap. The Crossrail symbol on the station. Are we looking North or South in the visualisation. 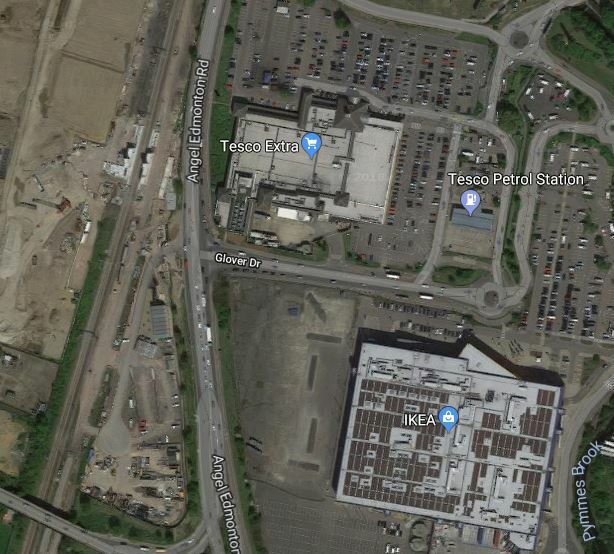 I suspect that what gets built could be rather different and a lot better with perhaps a continuous garden bridge from West of railway to Glover Drive, where Tesco and IKEA are situated.